SCHOOLS AND TOURIST attractions across the San Francisco Bay Area have been shut today as smoke from California’s deadliest ever wildfire a three-hour drive away produced air quality levels worse than in polluted megacities in South Asia. The closures came as the number of people missing from the giant Camp Fire, which has devoured an area roughly the size of Chicago since it broke out last week, soared to more than 600, with 63 confirmed dead. US president Donald Trump is set to visit the tinder-dry state tomorrow to meet victims of the inferno, which has laid waste to the town of Paradise at the northern foothills of the Sierra Nevada mountains, destroying around 10,000 homes. Some 290 kilometres to the southwest, San Francisco ordered all public schools shut and its iconic cable cars returned to their stations as the Air Quality Index soared to 213, comparable to Dhaka, Bangladesh and worse than Kolkata, India. 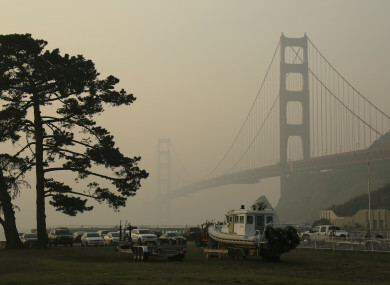 Photos posted on social media showed the famous Golden Gate Bridge shrouded in thick smog. Yesterday, authorities raised the number of missing people from 300 to 631 as investigators went back and reviewed emergency calls made when the Camp Fire erupted on 8 November. “I want you to understand that the chaos we were dealing with was extraordinary” Butte County Sheriff Kory Honea told journalists of the early days of the fire, explaining the alarming increase. A total of 461 rescuers, assisted by 22 sniffer dogs, were going from house to house, as authorities called on relatives of the missing to provide DNA samples to help with identification of the dead. The remains of seven additional victims discovered by rescuers yesterday brought to 63 the number of people who have died in the Camp Fire, which remained only 45% contained this morning. That inferno, which is about two-thirds the size of the Camp Fire, was close to 70% contained today, as authorities predicted they would have it under control by Monday. Email “California air quality worse than polluted South Asian cities as wildfire death toll hits 63”. Feedback on “California air quality worse than polluted South Asian cities as wildfire death toll hits 63”.